Best Value Home Inspection realizes that the purchase of a home is probably the largest and most exciting investment you will ever make. It is difficult to remove any emotional attachment you may have for a home due to it's location, style, setting, etc. A home inspection will help you learn as much as you can about the property you are considering buying in an effort to help you make a more informed decision as a buyer. Our philosophy at Best Value Home Inspection is to inspect each home with the utmost care, to be thorough, and to explain our findings clearly to each client. Paul Wells is a licensed home inspector. Whether you need a pre-purchase, pre-list, or general home inspection, a Best Value Home Inspection inspector is available to discuss how our services can meet your needs. Our impartial and experienced inspector can help you make an educated real estate investment. We will discuss with you the top 11 defects found in most homes. Best Value Home Inspection would like to provide you a Virtual Home Inspection Tour, created by the American Society of Home Inspectors. Thank you very much!! If you ever need a reference, I'd be happy to give you a solid two thumbs up. Should I come across anyone who needs an inspection done, I will be sure to recommend you to them. You are a man of your word! Thanks so much Paul. We appreciate your thoroughness, professionalism and the time you took to conduct our inspection. Thanks again. We'll be calling you again when we're ready for an inspection on the house I'm living in now. My realtor gave me a list of local home inspectors when I was purchasing my new home. I was looking for someone affordable and experienced. When I chose Paul Wells, I got more than I bargained for...in a good way. His direct, no nonsense approach and his professional attitude set me at ease with my purchase. Even when I had a question or doubt, Mr. Wells went the extra mile to make sure that everything was right as rain before closing. I highly recommend him. When Paul inspected our house he did a very thorough and professional job. Since we moved in we have not discovered any problems with our new house that he did not find in the inspection he did for us. Best Value Home Inspection completes a systematic inspection with integrity and experience. The inspection and report were organized professionally and promptly. Paul offered suggestions for any questionable areas. Paul Wells did my home inspection in November. He was very thorough and did honest work. He was very helpful with tips on how to correct some minor problems. He worked for a very reasonable price and I would highly recommend him to anyone who needs a home inspection. While in the middle of a permanent change of station coming from Germany, we were under a short time frame in order to get into a house. As first time homebuyers, we were not sure of the process and once we found the house we wanted we contacted Paul Wells with Best Value Home Inspection to conduct our inspection. Paul Wells did an extremely thorough inspection of the house in a very quick and short time frame. Knowing that we were first time homebuyers, he explained everything and simplified the process which made the entire process more enjoyable. I would highly recommend Paul Wells to anyone we know getting a home inspection. James and I want to thank you so very much for making yourself available on such short notice to perform a home inspection for us. Being from out of state, we were in the Elizabethtown area for only a weekend to make a decision on purchasing a large home. Our offer on the home was accepted that Saturday evening. We were not aware, however, that if we opted for a home inspection, we would have to be present and that the inspection would have to be done within ten days of purchase. Our schedule did not allow for us to stay longer than the weekend and we could not return within ten days. Within minutes of being contacted, you kindly rearranged your schedule in order to do the inspection the very next day! We could not believe how quickly you accommodated us and despite treacherous driving conditions due to snow, you were at the home by 9 a.m. Sunday morning! We are truly grateful for the consideration you gave to our situation and cannot thank you enough. Not only did you go out of your way to see that we could get a timely inspection, but you were so helpful and informative during the entire process. No question was too trivial for you and they all were addressed with the patience and the knowledge gathered over your 30 years in the construction business. The wealth of knowledge you shared with us was invaluable. Your determination in finding elusive water shut-off valves and puzzling over unmarked breaker panels, to name a few, was quite admirable and displayed to us not only the commitment to your work, but compassion, caring, and well being for your customers. As promised, you emailed a complete, detailed report to us by day’s end! The next day you followed up with a phone call to review the report and answer any questions. You are to be commended for your thoroughness and resolve in completing such a daunting job and without the slightest hint of being inconvenienced. The amount of work and energy you devoted to this inspection is, to say the least, amazing. Additionally, your fee was extremely reasonable considering the labor expended and the comprehensive account we received of your assessment. It is obvious to us why you are highly recommended and we will be only too happy to pass that recommendation on to others! Thanks for doing such a GREAT JOB on my home inspection and the re-inspection. Thank you so much for such a great service. I appreciate you taking the time to be thorough and to show and explain everything to us. You definitely are a man of honesty and integrity. I will be recommending you to others. We just wanted to thank you again for your amazing work! Being far away while trying to buy our first home can be stressful, but people and businesses like yours make it a lot easier! Thank you again! We used Paul Wells for our home inspection and to be honest once he came out he was OUR home inspector and everything he did from that point was for our benefit. Can't give this man enough top marks for everything he has done for us in our home purchase process. Paul Wells is a Elizabethtown home inspector providing unbiased, accurate and thorough home inspections in Elizabethtown and the surrounding areas. Mr. Wells owns and operates Best Value Home Inspection. Paul Wells has inspected many homes in the State of Kentucky and throughout that time he has provided accurate, informative and reliable information to home owners and home buyers throughout Hardin County and surrounding county areas. Paul Wells is always thorough and enjoys taking the time to inspect the home with the client, to answer questions, and to give advice about repairs. Mr. Wells is a field-experienced inspector and follows National Standards as well as those of the State of Kentucky. Paul Wells has over 30 years in the construction field in both residential and commercial. 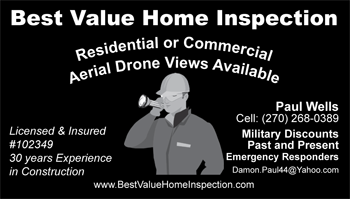 Business owner of Paul Wells Construction and Best Value Home Inspection. When you need a home inspection, don’t hesitate to call Best Value Home Inspection. If you own your home, Paul Wells will give you a cost and commitment-free consultation. Trust Paul Wells to tell you nothing but the truth about your home. Come talk to Best Value Home Inspection today, and learn more about how Paul Wells can help you.